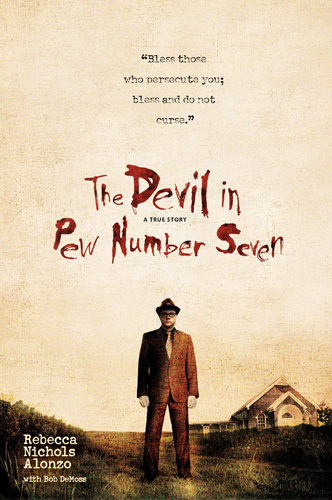 The Devil in Pew Number Seven isn’t your typical true crime story. It is a story about the power of forgiveness. WOW! What a phenomenal story of faith and forgiveness. From page one I was entranced by this very real, very true story. I rejoiced in the triumphs, I sat on the edge of my seat during the chilling terror, I cried through the heartache, and I sobbed through the ending. Rebecca Nichols Alonzo takes us deep into the lives of her family. Growing up as a pastor’s daughter, Rebecca learned from the crib God’s love and faithfulness, even during times of shear terror. In a world where an eye for eye holds precidence, Rebecca’s father lived out the Biblical adage, “turn the other cheek”. The Nichols instilled their love for God and their neighbor into their children, bringing about one of the most powerful testimonies I’ve ever heard. Rebecca’s testimony, just as was her father’s ministry, is for such a time as this. No matter what sort of pain you’ve expereinced, whether from a cutting remark or from child abuse and everything in between, The Devil in Pew Number Seven is a must read! Rebecca Nichols Alonzo is a speaker on betrayal and the power of forgiveness. She has been involved in ministry including a church plant, youth outreach, and missions, for over a decade. She and her husband live in Franklin, Tennessee, with their two children. Visit her at www.beckyalonzo.com. Wow. This is a true story? That is really amazing. I’m gonna have to read this. Rebecca, I highly suggest it. It makes little things in our lives that we’ve been holding onto seem so very trivial. I just wanted to thank you and your brother for going on national television, and proclaiming the power of God in our lives, and how we can forgive, and use a tragedy for the good! I too have learned the power of forgiveness, and I have been given the opportunity many times to share my story with people I have met in my life. They are always like how can you forgive your step-dad for all he had done. It has been a great priviledge for me to be able to share the love and power of God in my life! Thank you for sharing how powerful forgiveness can be! Pingback: Christina Rich | Writing Prompts &Thoughts & Ideas...Oh My!